We have teamed up with HIS to giveaway one of its new HD 5770 IceQ 5 Turbo 1GB video cards as well as one of its HD 5550 Silence 512MB video cards and they have a combined value worth $252 USD! The lucky winner of this week’s giveaway will not only win one, but two video cards from HIS. 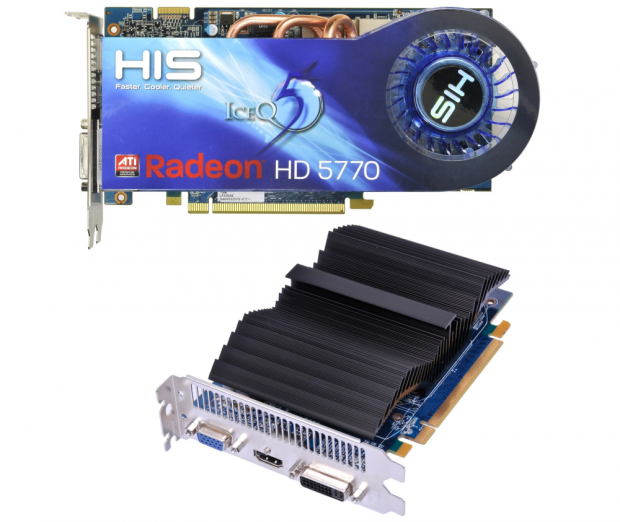 The first is the new HD 5770 IceQ 5 Turbo 1GB 128-bit GDDR5 PCIe video card that comes with DirectX 11 and Eyefinity support. In the package, you will also get a DiRT 2 game coupon inside as a bonus. The second video card is the HD 5550 Silence 512MB 128-bit GDDR5 PCIe video card that comes with DirectX 11 and Full HD 1080p output support. "I want to win the HIS HD 5770 IceQ 5 Turbo 1GB and HD 5550 Silence 512MB video cards at TweakTown!" Giveaway runs from today until August 10th 2010 at 10:00pm GMT +8:00 - no entries will be taken into consideration after that time. If you are a winner, you will be asked to provide your full name, address and telephone number for shipping. Last edited by yans311; 08-03-2010 at 05:55 PM. I'm a fan, good luck everybody! Already a fan and posted!Thank you Tweaktown. I'll win this, as i'm already a fan! (haha) optimistic! i'm a new fan of TweakTown's Facebook page! i`m a fan and i have posted.all the best,thanks.